Classic Italian recipe. Kitchen of love. Made with 80% potato. Cooks in only 2 minutes. No refrigeration need. Cooking Time: 2 minutes. www.cucinaandamore.com. Product of Italy. Enriched macaroni product. With spring water. Source of the Verde River. Italy. 5-1/2 min. www.delverde.com. Product with exclusive use of ingredients GMO free (maize). SGS. Vegan. Made with the pure water of the Verde River in Italy, an ancient river filtered by 7-million-year-old rocks that gives our pasta its unique and pure taste. Produced in Italy. Enriched macaroni product. Cooking Time: 7 min. Homemade taste. Authentic, simple and pure. 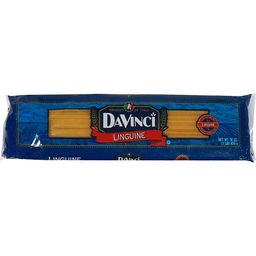 Premium durum wheat semolina. 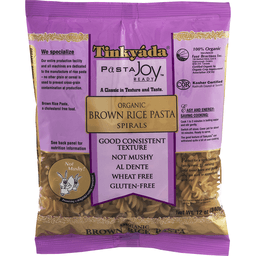 Slow dried to maintain protein and quality. Delverde originated in the picturesque village of Fara San Martino in the Abruzzo Region of Italy. It is here where centuries-old regional pasta making traditions and natural local ingredients are combined forming the ideal place to make the best pasta. What Makes Delverde Taste So Good? 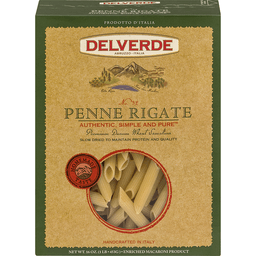 : Delverde pasta is still produced the traditional way with the best quality, local ingredients including the finest durum wheat semolina and natural spring water from the Verde River. Following centuries-old pasta making traditions, we use bronze dies for the ideal texture and slowly dry our pasta at low temperatures to maintain all of the wheat's nutritional value and genuine taste. 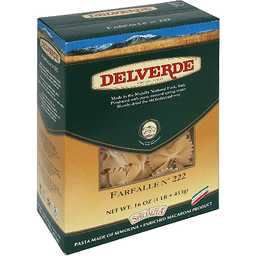 Our unmatched care ensures every box of Delverde contains all of the legendary goodness of Italian pasta - a rich, fragrant taste and al dente texture. How to Judge Pasta? 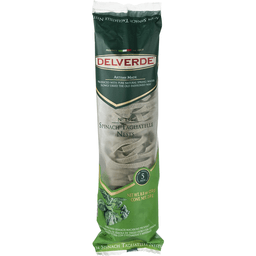 : Delverde has a rich, fragrant taste - Unlike pasta made with a blend of flours, Delverde carefully selects the finest durum wheat semolina that gives the pasta its distinct taste. 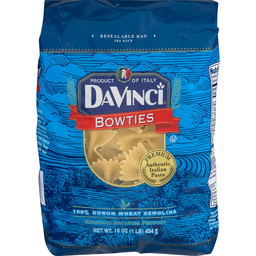 Delverde clings to sauce - Unlike other smooth pasta noodles, Delverde pasta is made using bronze dies creating an ideal, textured surface. 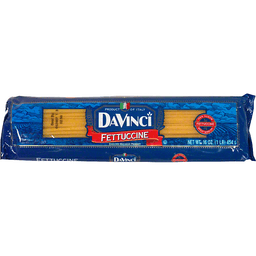 Delverde cooks perfectly al dente - for the right bite every time. Handcrafted in Italy. 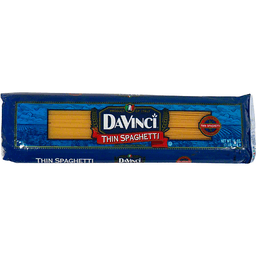 Delverde Spaghetti No. 4. Abruzzo - Italia. Authentic, Simple and Pure™. 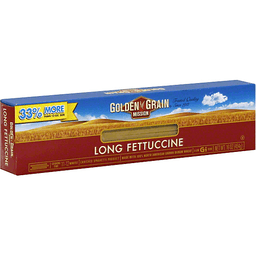 Premium durum wheat semolina. 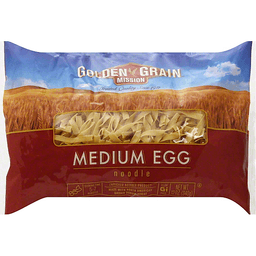 Slow dried to maintain protein and quality. Handcrafted in Italy. Homemade taste. Enriched macaroni product. Fara San Martino Italy. Delverde originates in the picturesque village of Fara San Martino in the Abruzzo Region of Italy. It is here where centuries - old regional pasta making traditions and natural local ingredients are combined forming the ideal place to make the best pasta. 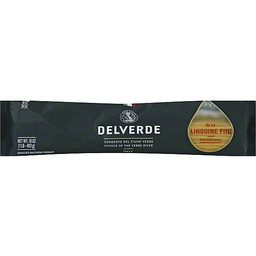 What makes Delverde taste so good Delverde pasta is still produced the traditional way with the best quality, local ingredients including the finest durum wheat semolina and natural spring water from the Verde River. Following centuries-old pasta making traditions, we use bronze dies for the ideal texture and slowly dry our pasta at low temperatures to maintain all of the wheat's nutritional value and genuine taste. 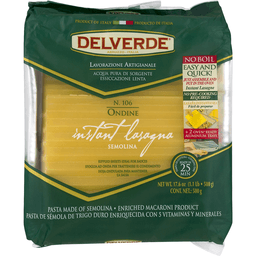 Our unmatched care ensures every box of Delverde contains all of the legendary goodness of Italian pasta - a rich, fragrant taste and al dente texture. 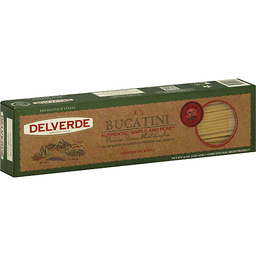 How to judge pasta Delverde has a rich, fragrant taste - unlike pasta made with a blend of flours, Delverde carefully selects the finest durum wheat semolina that gives the pasta its distinct taste. 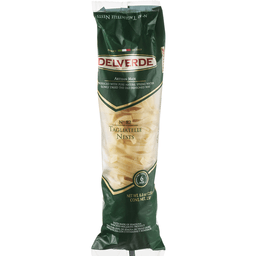 Delverde clings to sauce - unlike other smooth pasta noodles, Delverde pasta is made using bronze dies creating an ideal, textured surface. 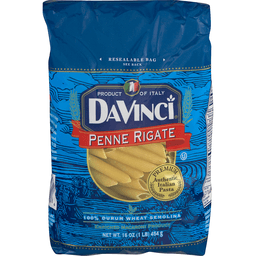 Delverde cooks perfectly al dente - for the right "bite" every time. Respect the environment. Artisan made. Bronze dies. Slow dried. Spring water. 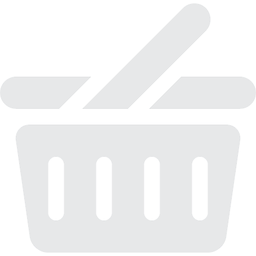 For recipes & information about all the Delverde products visit www.delverde.us. 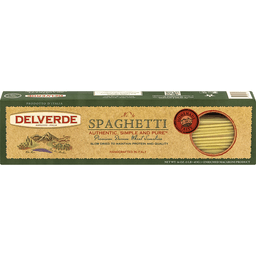 Delverde Nests With Spring Water No 82 Tagliatelle Pure taste. Source of the Verde river. Italy. No 82. Nests with spring water. Enriched macaroni product. 6 min. NET WT 8.8 OZ (250g). Made with the pure water of the Verde river in Italy, an ancient river filtered by 7-million-year-old-rocks that gives our pasta its unique and pure taste. Product with exclusive use of ingredients GMO free (maize). www.delverde.com. 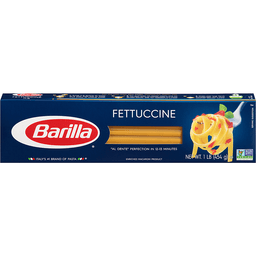 Enriched spinach macaroni product. With spring water. 5-3/4 min. Pure taste. Source of the Verde River. Italy. Made with the pure water of the Verde River in Italy, an ancient river filtered by 7-million-year-old rocks that gives our pasta its unique and pure taste. 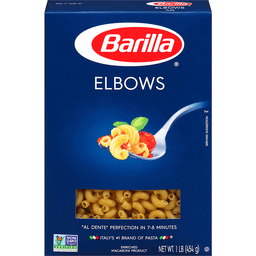 Enriched macaroni product. www.delverde.com. Food safe. Product with exclusive use of ingredients GMO free (Maize). Vegan. Produced in Italy. 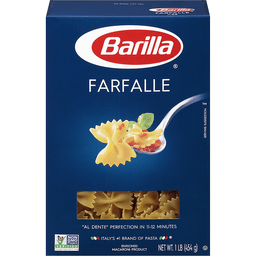 2X the fiber of regular pasta (5 g fiber in Golden Grain 100% Whole Grain Pasta, 2 g fiber in regular pasta). 1 natural ingredient. 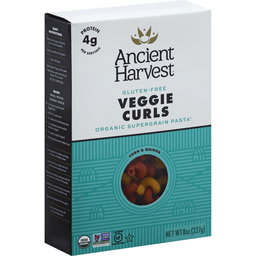 190 calories, 0 g sat fat (0% DV), 0 mg sodium (0% DV), 2 g sugars, 5 g fiber (20% DV), iron (15% DV) per 2/3 cup. Whole wheat macaroni product. American Heart Association certified. Meets criteria for heart-healthy food. Diets rich in whole grain foods and other plant foods and low in saturated fat and cholesterol may help reduce the risk of heart disease. 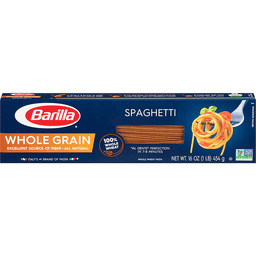 Not all whole grain pasta is equal. 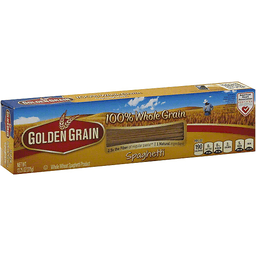 If it's not 100% whole grain, it's not Golden Grain. One simple, all natural ingredient - whole durum wheat flour. Heart healthy: cholesterol-free, low fat and sodium free. Full day's worth of whole grain in every serving. Excellent source of fiber (20% of your daily value). 100% delicious taste and texture, with no compromises! 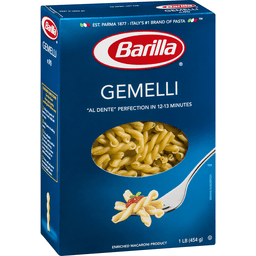 GoldenGrainPasta.com. 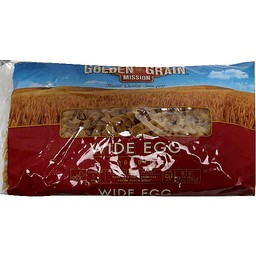 100% whole grain - 56 grams per serving. Eat 48 g or more of whole grains daily. 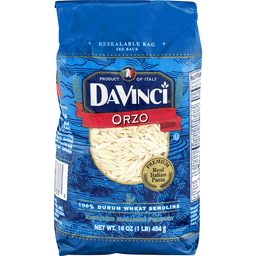 Made with 100% durum wheat. 100% recycled paperboard. Including 30% post-consumer content. Made in the USA. 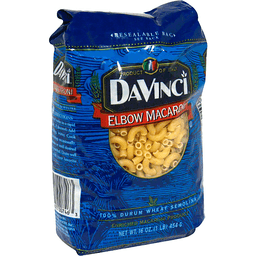 Enriched macaroni product. Short (Salad) Macaroni. An American classic. 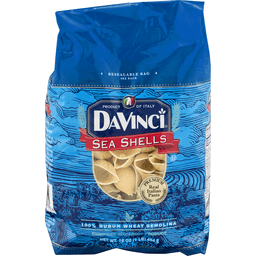 200 calories, 0 g sat fat (0% DV), 0 mg sodium (0% DV), 2 g sugars, iron (10% DV) per 1/2 cup. A classic American story. In 1912, Charlie and Maria DeDomenico started the Gragnano products pasta factory in San Francisco's Mission district, supplying local restaurants and Italian groceries with top quality pasta. Twenty years later, they changed the name to the Golden Grain Macaroni Company and ever since, generations have embraced Golden Grain for classic American pasta meals and noodle dishes. 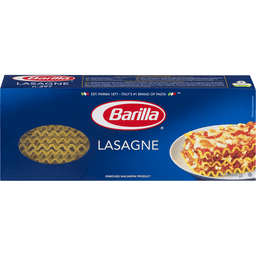 GoldenGrainPasta.com. Made with 100% durum wheat. 100% recycled paperboard. Including 30% post-consumer content. Organic non-GMO tofu strips. Fresh. Delicious. USDA organic. Gluten free. All vegan. 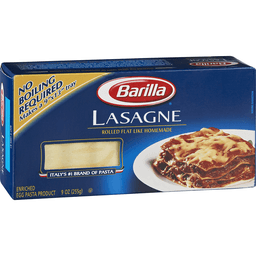 17 g protein per serving. Fully cooked/Ready-to-eat. Taste the difference! At Hodo Soy, our mission is to craft the highest quality tofu and to create innovative and delicious tofu-based artisan foods that will forever change the way you know tofu. Our hand-crafted tofu is made from organic, non-GMO, US-grown whole soybeans. Hodo Tofu reflects, in both taste and nutrition, the high quality ingredients we use. What is Yuba? Why it is so delicious? Hodo Yuba Noodles are made from our handmade, fresh Yuba. Yuba, also called bean curd sheet, is the thin veil that forms on the surface as the cream rises in heated soymilk when we make tofu. Hodo Sesame Yuba Noodles are a delectable meal of hand-cut seared Yuba strips glazed with a creamy and luscious tahini dressing. 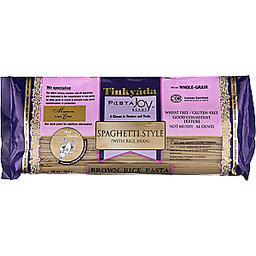 Reminiscent of fresh pasta, the savory noodles are delightfully rich with fruity and nutty undertones. 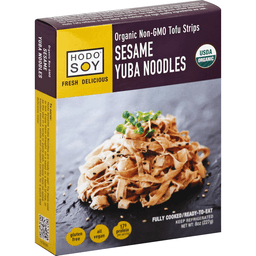 Hodo Sesame Yuba Noodles are all organic and gluten-free. Excellent source of protein & fiber. Good source of iron. For recipes and company info, including our Beanery tour: www.hodosoy.com. Follow (at)hodosoy: Facebook; Twitter; Pinterest; Instagram. Certified organic by CCOF. Organic is non-GMO & more. Please recycle. www.hodosoy.com. 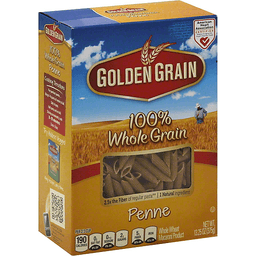 Whole wheat macaroni product. 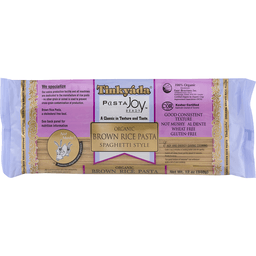 2.5x the fiber of regular pasta (5 g fiber in Golden Grain 100% whole grain pasta, 2 g fiber in regular pasta). 1 natural ingredient. 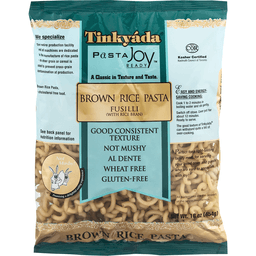 Per 1/2 Cup: 190 calories; 0 g sat fat (0% DV); 0 mg sodium (0% DV) 2 g sugars; 5 g fiber (20 DV); iron (15% DV). Diets rich in whole grain foods and other plant foods, and low in saturated fat and cholesterol may help reduce the risk of heart disease. American Heart Association certified. Meets criteria for heart healthy food. 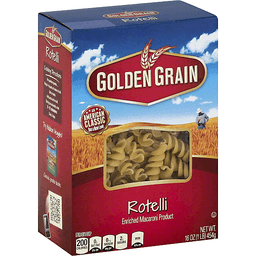 Not all whole grain pasta is equal. 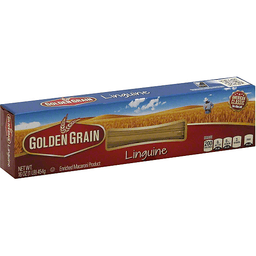 If it's not 100% whole grain, it's not Golden Grain. One simple, all natural ingredient - whole durum wheat flour. Heart Healthy: cholesterol-free, low fat, and sodium-free. Full day's worth of whole grain in every serving. Excellent source of fiber (20% of your daily value). 100% delicious taste and texture, with no compromise! 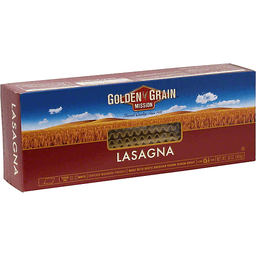 GoldenGrainPasta.com. Any recipe, any time. 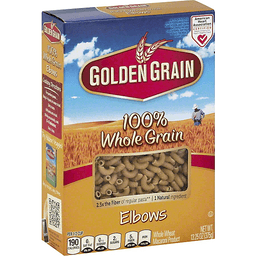 100% Whole Grain: 56 grams per serving. WholeGrainsCouncil.org. Eat 48 g or more of whole grains daily. Comments or questions, please call 877-EAT-PASTA (877-328-7278). 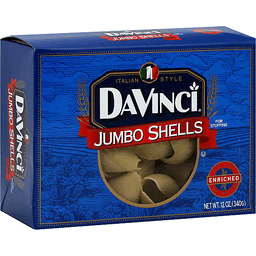 100% recycled paperboard including 30% post-consumer content. Made in the USA. Whole wheat spaghetti product. 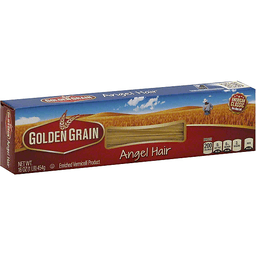 2.5X the fiber of regular pasta (5 g fiber in Golden Grain 100% Whole Grain Pasta, 2 g fiber in regular pasta). 1 natural ingredient. American Heart Association certified. Meets criteria for heart-healthy food. Diets rich in whole grain foods and other plant foods and low in saturated fat and cholesterol may help reduce the risk of heart disease. 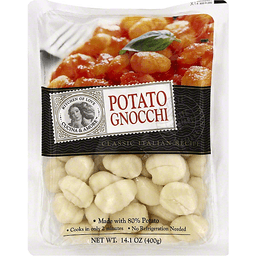 190 calories, 0 g sat fat (0% DV), 0 mg sodium (0% DV), 2 g sugars, 5 g fiber (20% DV), iron (15% DV) per 2 oz. 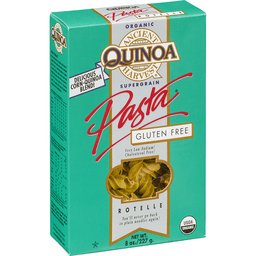 Not all whole grain pasta is equal. If it's not 100% whole grain, it's not 100% whole grain. One simple, all natural ingredient - whole durum wheat flour. Heart healthy: cholesterol-free, low fat and sodium free. 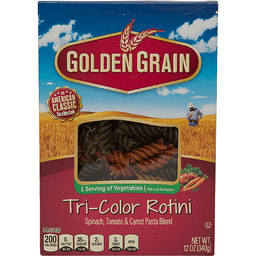 Full day's worth of whole grain in every serving. Excellent source of fiber (20% of your daily value). 100% delicious taste and texture, with no compromises! 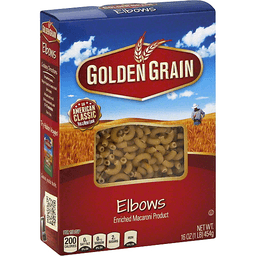 100% whole grain - 56 grams per serving. Eat 48 g or more of whole grains daily. 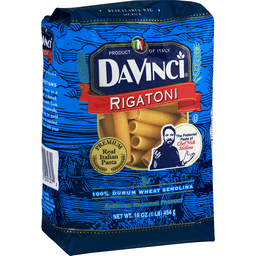 Made with 100% durum wheat. 100% recycled paperboard. Including 30% post-consumer content. Made in the USA. The classic seafood marriage of steamed crab and North Atlantic lobster. Chef crafted. 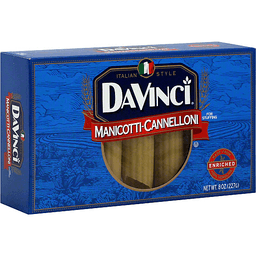 Artisan pasta. Award winning. 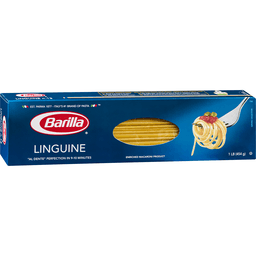 Since 1989, this pasta has been served in the finest restaurants and has won numerous awards at International competitions. 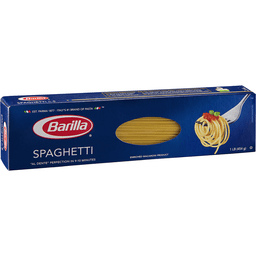 Serve our chef crafted pasta in your home and enjoy a true restaurant experience tonight. 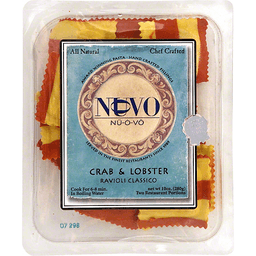 nuovopasta.com. 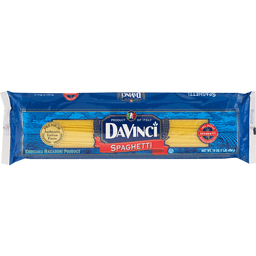 Winner of 12 NASFT Sofi Awards for outstanding pasta and sauces.